The water mesh can provide buoyancy simulation (it can have a body assigned). 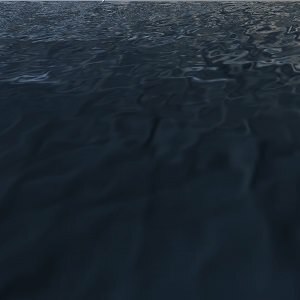 The underwater mode is not available for the water mesh. The water mesh can have multiple water levels. It means that you can create, for example, a water flow with height difference located above the sea level (i.e. the filling level of global water). 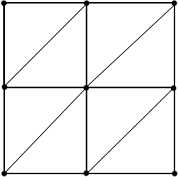 The mesh should be flat and have a uniform grid. 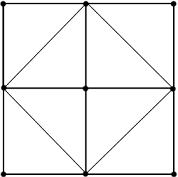 The mesh should be oriented strictly along the axes. The mesh should have the UV map. 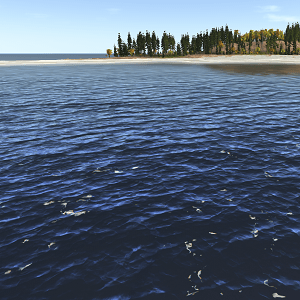 Otherwise, normal maps used to simulate water surface rippling won't be applied. 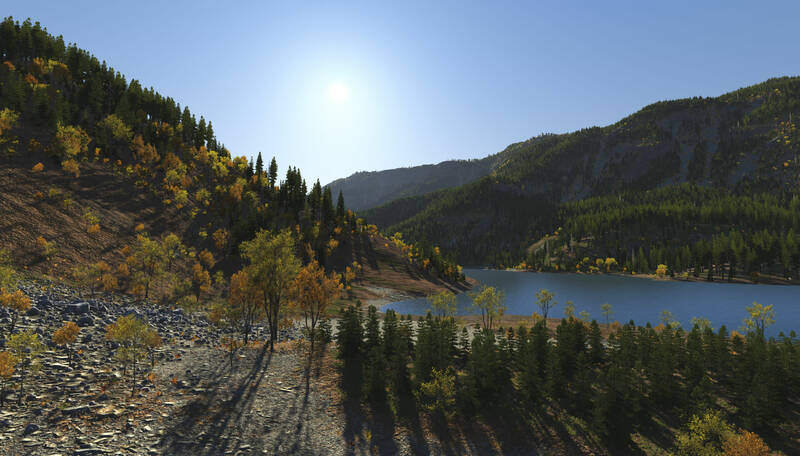 If one mesh is used to represent several water basins with dynamic reflections, they all should be exported on the same level (height) (as dynamic reflections are calculated correctly only for flat horizontal meshes exported on the same level). You still can create a mesh with different heights, however, in this case, you will be limited to static reflections only. 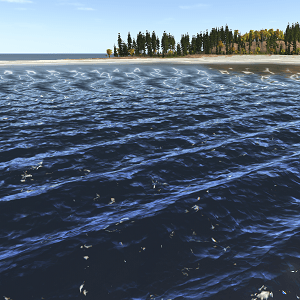 Scale of mesh UV coordinates affects appearance of water waves simulated by using normal maps. For example, if you apply the same normal map to 2 meshes with UV coordinates at the scale of 1:1 and 2:1 correspondingly, waves on the 2nd mesh will be narrower than on the 1st mesh because of normal map tiling. To simulate a river flow, make sure that its UV map is rectangular. 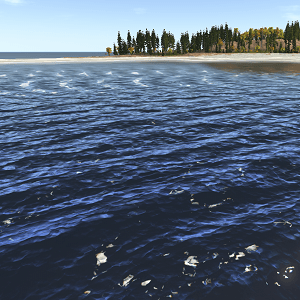 In the Node tab, water surfaces that determine optical and dynamic behaviour of water can be adjusted. In the Water Mesh tab, waves that determine periodic and sinusoidal nature of water can be set. 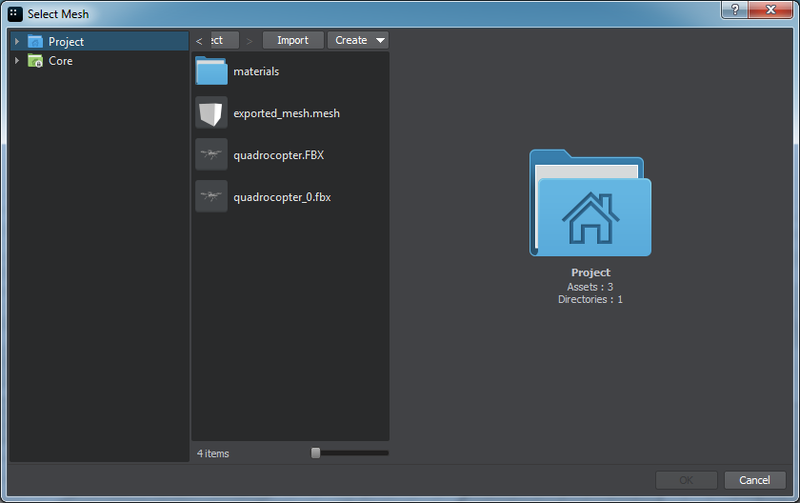 Also on the Water Mesh tab, you can set a mesh to used for the water mesh object and specify a field mask. 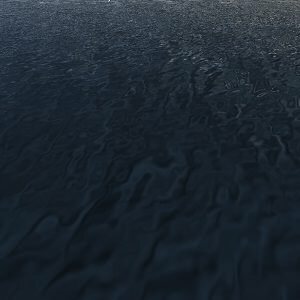 By default, water surface ripples according to normal maps (see the water_mesh_base material). However, different kinds of waves can be also simulated with 4 directional geometrical waves, summed to create dynamic waves. This model uses static geometry animated in vertex shader. Movement each of the wave is set independently that enhances flexibility of adjustment. By the minimum value of 0, the wave spreads along the Y axis and is parallel to the X axis. Positive values rotate the wave about the Z axis, meaning the wave direction is slanted counterclockwise relative to its initial spread. Negative values rotate the wave on the water surface clockwise. By the maximum possible values of 180 or -180, the wave direction becomes parallel to the X axis yet again. The minimum value of 0 means the wave is inactive. 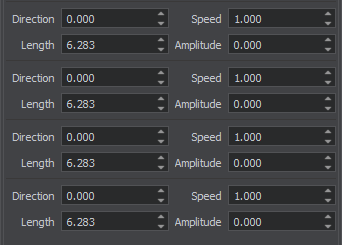 Increasing the value results in waves following each other faster. The smaller the value is, the more rippled the water surface is. The higher the value is, the broader formed waves are. Amplitude determines the distance between the highest and the lowest wave peaks. Together with the length, it sets the wave form. The minimum value of 0 means the wave is not formed. Increasing the value forms higher waves up to tsunami-like ones. To initiate physical simulation of water, it should have a water body assigned and enabled. 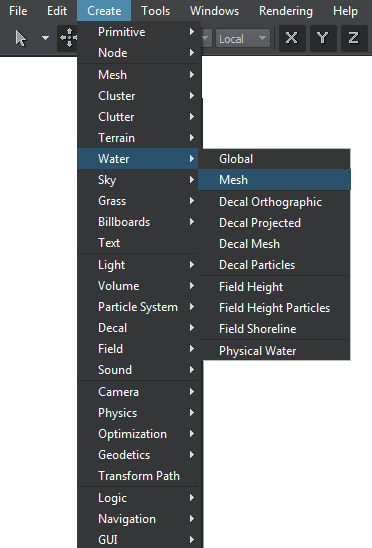 These options are available only for water mesh objects, because of their finite size. If prolongation of the covered area is required, it can be done without the artists exerting additional efforts: water meshes are simply placed next to each other. However, the waves from the objects do not spread on the adjacent mesh. Sinusoidal waves can be synchronized, if necessary, by changing the sign of the amplitude value. As an option, a body of the water can be named in the corresponding field to be identified and handled by UnigineScript. Water meshes must be exported at the center of world coordinates; otherwise, some effects (for example, caustics) may not be rendered correctly.